I am massive and powerful. I am the ideology and the statement. Play me because you want me. Let me roll because I can. Let me amaze because I will. The Imperial is a big body, full hollow, dual pickup, 22 fret electric guitar, featuring arched top and back, bent sides and a 647mm scale. 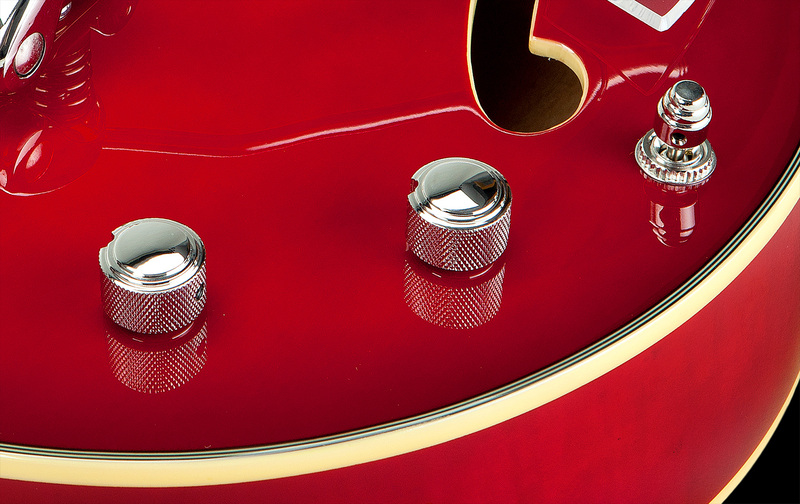 The Imperial is a double F-Hole design, fitted with a floating transparent pickguard and our unique Saturn fretboard inlays. Following the tradition of former German luthiers, we selected Spruce as our choice wood for the top. When you turn the guitar around, you will see that we chose flamed maple for the back and sides, which slightly shimmers through the translucent finishes. 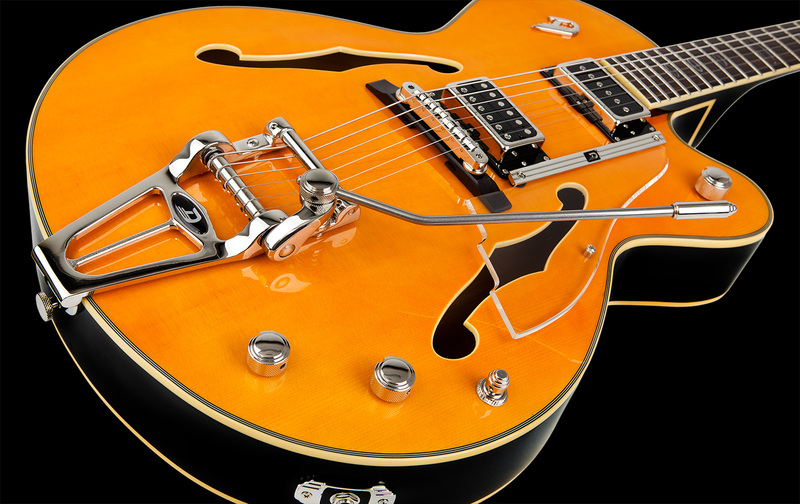 The Imperial sports the proven Duesenberg pickup combination of our balanced, classicly wound GrandVintage humbucker for the bridge position and a smooth, creamy Domino P90 for the neck position. 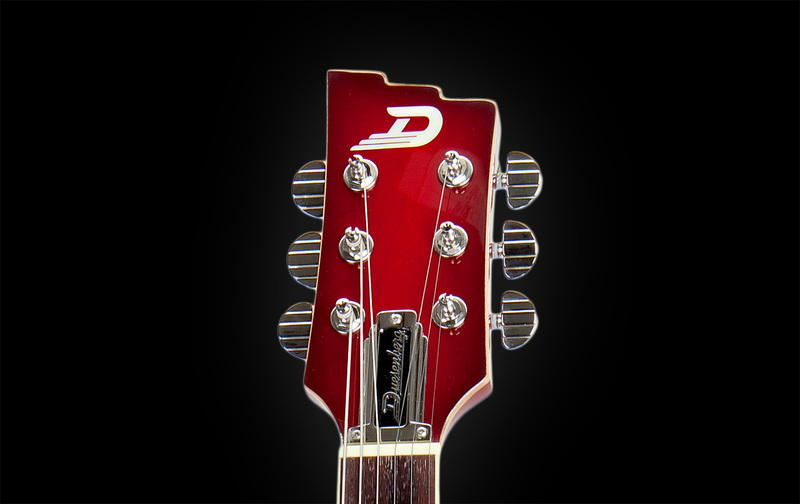 Our Mid-Shift pots additionally allow you to shift certain midrange frequencies to further customize your individual tone. We also released an all black version of the Imperial which is fitted with two of our transparent and twangy D-Tron pickups, called the Imperial D-Tron. 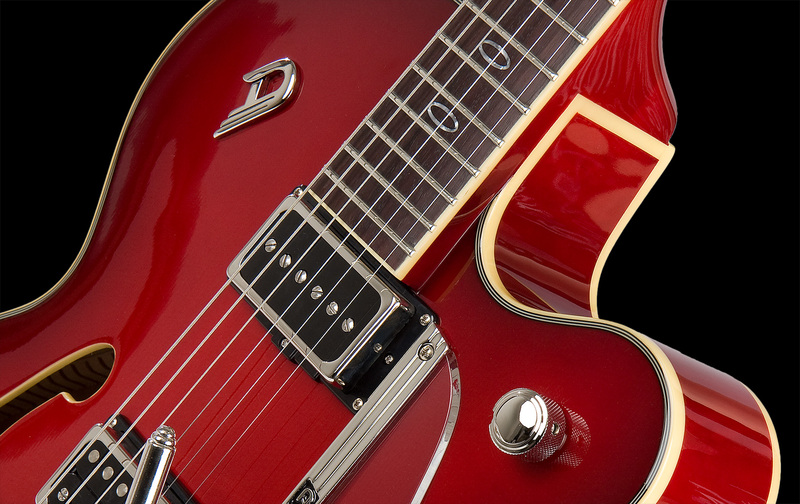 The standard version of the Imperial (Humbucker/P90) is available in a beautiful Red-Burst or Light-Orange finish. The dual D-Tron version is available in an elegant High-Gloss Black. The Imperial is our largest instrument so far and deserves its place amongst the great Rockabilly and Jazz instruments of the past decades. Height (sides): 7.5 cm / 3"